The stylish Phoenix Light Duty is constructed using the highest quality 316L stainless steel materials for a robust, long lasting tank that is perfect for light duty commercial applications. Extremely efficient, the Phoenix LD is a condensing gas water heater that operates at 97% thermal efficiency and is extremely versatile that’s been tested in commercial use and can stand up to the needs of a busy household, or light commercial setting. Combine it with an air handler for great performance in your hydronic system. The impressive stainless steel finish, easy to program and understand LCD display and extreme cost savings makes the Phoenix LD the appliance you’ll want to brag about. 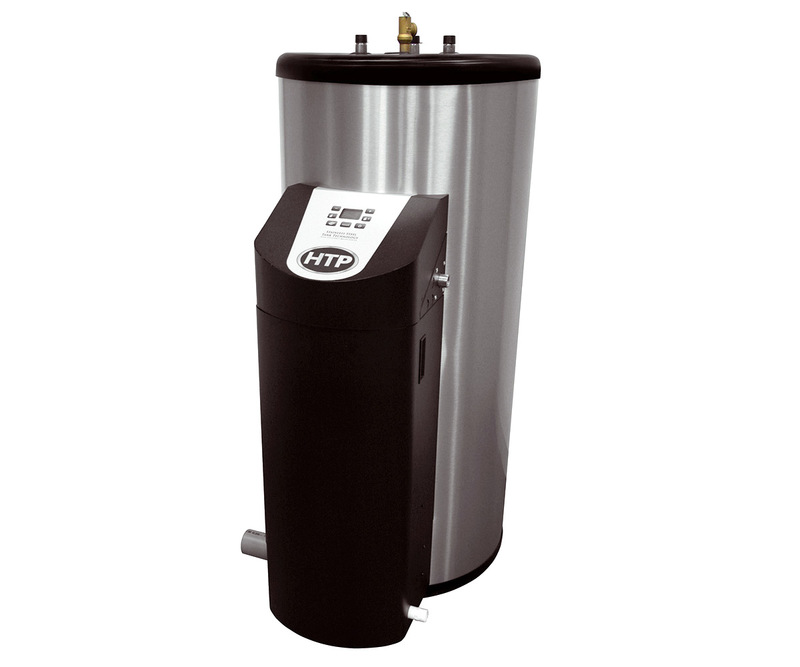 On par with the most efficient tankless water heaters, and well above standard gas tank water heaters. Unlike a standard tank water heater where the pilot light is always on and using fuel, the Phoenix does not have a standing pilot light. The only time it is using fuel is when there is a call for heat from the thermostat. The thermostat keeps hot water in the tank while minimizing fuel used. Ideal for those who can’t increase gas meter output or gas line size to accommodate a higher BTU tankless. 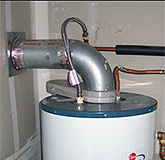 Uses standard 1/2″ gas line, just like a regular gas tank water heater. Stainless steel tank with no anode rods provides for a longer life, less corrosion risk and an attractive look. Saves space vs 2 larger tanks. One Phoenix LD can replace the delivery of two 65 or 75 gallon tanks easily. Works well in situations such as condos, when a tankless or combi-boiler may not be an option. High capacity of hot water with fast recovery rate exceeds standard tank water heaters. Built to deliver more water to more appliances at the same time. Compare first hour rating; the amount of hot water your tank can make in one hour of use. 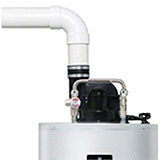 The 50 gallon Phoenix LD provides 133 gallons vs standard 50 gallon gas water heater average of 70-80 gallons. Patent pending combustion system modulates from 25,000 btu’s up to 76,000 btu’s giving you twice the recovery rate of a standard 40,000 btu water heater. Compare the Phoenix Light Duty recovery rate of 98 gph (gallons per hour) at 90F rise to the 25-40 recovery rate of a standard tank. And that means less waiting for hot water for your and your family. While this product can’t match a tankless for “endless hot water”, it gets pretty close to it. 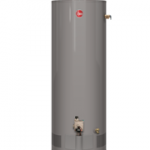 Why would I want a light duty commercial water heater instead of a regular tank or tankless? 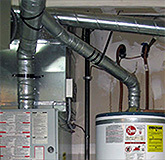 There are many benefits of using the light duty commercial water heater in a residential setting. 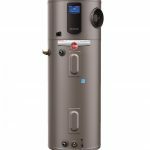 One is the power of that water heater to provide a greater amount of hot water with faster recovery than a standard tank. Like a standard tank water heater, the water is hot and waiting for you, and it does not have the delay you find in a tankless. And like a tankless, it’s super efficient. The Phoenix is battle tested in commercial applications so it’s a tough product, ready to work hard for you. Why would you recommend the Phoenix LD to multiple tank user households? We have seen excellent results from our customers who choose to install a Phoenix LD water heater in place of dual tanks. For example, we recently replaced two 75 gallon tanks that were providing hot water to 4 units with one 60 gallon Phoenix LD. They are happy with their new water source and have lots of extra space freed up to store bicycles in the common area. What makes the Phoenix Light Duty gas water heater “light duty”? 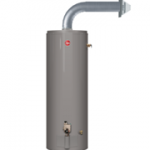 The Phoenix LD is the residential version of HTP’s popular Phoenix commercial water heater. The Light Duty is a designation it has because it heats at a lower BTU level (76000 btu’s) than a standard commercial grade product. Typically the commercial grade product is defined by over 75k Btu’s or over 100 gallon capacity. The lower btu’s enables it to be strong but qualified for residential needs. 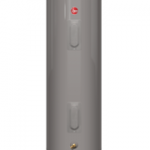 What types of properties are the best fit for the Phoenix LD water heater? On the residential side, the Phoenix LD is a great fit for single family homes and condos. It’s also perfect for use in light commercial settings such as offices, restaurants, hair salons, shops. Our team can help you find the right fit for your home or business and provide options across multiple brands to suit your needs and budget.